Simmer rice in 2 cups water (with 1/2 tsp salt and 1 tbsp butter) for 15-20 minutes. 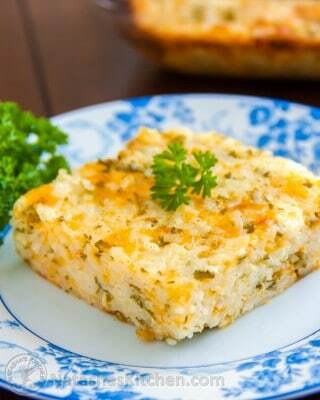 While the rice is cooking, beat two eggs in medium size mixing bowl with a fork; just until combined, finely grate the onion, chop 1 cup of parsley, grate 2 cups of cheddar cheese and add them to the bowl as well. Add 1 tsp. salt, 1/2 tsp dry mustard, 1 ½ cups milk, ½ cup oil, and mix all the ingredients together. Add cooked rice to the bowl with the rest of ingredients and mix everything together until combined. Using butter, grease a 9 x 11 baking dish, pour in the rice mixture and bake for 1 hour at 350˚F.